"Art is rad. Art is everything. I live for art, I love art. No art, no love. No art, no life. Ireally think that if people made a bit more art, then everything wouldn't be so crappy. And...uhhh...bringing stuff together, kind of maintaining..uh..did I mention I was amusician?" The world of commercial advertising is a dark and mysterious one that I don't pretend to understand. 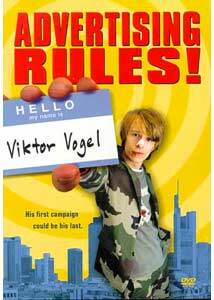 Originally released in Europe as Viktor Vogel: Commercial Man, Advertising Rules! is a brief jaunt into that strange world with a central character who fits in pretty well with his surroundings. We meet Viktor Vogel (Alexander Scheer), a young German lad who dreams of a job in the high-stakes world of advertising, but is content to work on album covers for his friend's band and live in a cramped and extremely trashed apartment. He attempts to bluff his way into a position with one of Frankfurt's top advertising men, Eddie Kaminsky (Götz George) and, in the process, practically loses him his account with Opel (one of Germany's top car manufacturers). As it turns out, Opel actually liked Vogel's clumsy attempt at brilliance and agree to continue working with Kaminsky so long as Vogel is brought in on the account.Kamisky comes up with a clever scheme; he'll hire Vogel but only to pretend he's really working on the account. Instead, all the ideas will be his own, and after Opel pays up for their campaign, Vogel will be out the door again. With Viktor's success also comes romance, as he suddenly becomes involved a young artist, Rosa (Chulpan Khamatova) who's ideas are very much in line with how Vogel thinks. They create an art exhibition entitled "The Hunt", in which Rosa will spear grocery items and photograph it. Unfortunately, due to nervousness, Vogel mistakenly proposes that idea to Opel as one for their ad campaign. They like it, but now he has to steer around the issue that he stole the idea from his girlfriend. With this, Vogel learns that with his move into his dream career, his life has become significantly more complex than he'd like.Though Advertising Rules! is a comedy at heart, it's unusually chaotic. It's not a particularly cheery look at life, but it can get rather lighthearted; it's both depressing and uplifting on many levels. The ultimate question is whether or not someone can go "commercial" yet still adhere to their artistic principals. Vogel begins to learn, the hard way, that his chosen business could care less about being underground or experimental; they only care about getting the job done as simply and cost-effectively as possible. So, Vogel bangs his against the brick wall of big business and, though he finds some success, still feels empty. Underneath all that, there's also a quirky romantic comedy, but again, not quite what you might expect.The film is genuinely funny most of the time, especially once all three of the central characters decide to go all-out in their artistic desires. They want "The Hunt" concept to succeed, but pulling it off will mean they'll all have to briefly ignore the standards that have been set for them. Advertising Rules! functions well as a satire of modern commercialism, but it might have trouble finding general appeal here in the US, the heart of consumerism. I say this because, had this been made in America, it would have been made sillier and escapist (and have a happier ending), likely excluding the depressing subject matter that makes it so effective and legitimate. Image Transfer Review: The 1:85:1 transfer is near-perfect, managing to look very film-like, but with less grain or fuzz on the compression. Colors are rich and brilliant, and the stark artistic style of the film's corporate sections is appropriately cold and clean. In contrast, the warm outside world has nice detail and subtle shading. There really are no complaints other thanminor source problems during the opening credits and occasional hairs or scratches. Audio Transfer Review: The Dolby 5.1 German language track is very good, but obviously not as active as an action film. Most of the full ambience comes from the musical score (provided by the band Minus 8), but there are still some good split-surround effects and good overall dynamics to the track. If a scene has the opportunity for surround activity or good, wide stereo effects, it seems to use it. The dialogue is clean and easy to hear, and there are no issues with harshness or sound drop-outs. The French is basically the same in terms of range and soundfield, with no distinguishable flaws. Extras Review: Surprisingly, despite being a relatively unknown foreign film, the disc has a few nice extras that primarily take the form of many deleted and alternate scenes. Most of the scenes were obviously removed because they interrupted the pace of the film, but they're certainly worth watching for fleshing out various details. The scenes are not anamorphic, and the time-indexing on the film is still present, which makes the subtitles a little tricky to read, but the quality is decent for deleted material. The interview collage is more deleted scenes, but an unusual sort of presentation in which the normal cuts are interrupted by the actors talking to the camera during the shot. They basically share thoughts on art, and it seems their comments were more motivated by their characters rather than real-life personalities. There's an original trailer, and the keepcase insert is pretty basic with chapter listings. The overall presentation (including animated menus) is nicely done. Not for everyone, but certainly worth a look, Advertising Rules! is a nice, laid-back experience. It's funny, but not always obviously so as it takes a comedic look at the world of advertising and those who inhabit it. Who knows, maybe the world would be much different if these were the kind of people behind commercials.